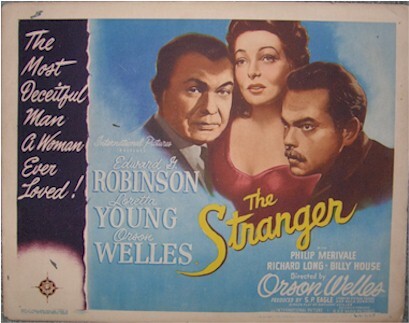 1946 - The artwork and brilliant colors (even better in person) on this Edward G Robinson / Orson Welles vintage Title Card is just stunning. This is theater-used with a pin hole in each of the four corner margins. There are three small holes- one grain of rice size and shape left of Mr. Robinson's shoulder and the other is in the margin colored area below black panel on left hand side of card. The other is in the border area on top left. But, overall in nice condition. A beautiful vintage piece! What a beautiful display ion your home or office.